Reducing anxiety – How long do your patients wait for surgery after admission? Reducing anxiety for patients is a key aim of an enhanced recovery pathway. In the pre-operative stage many units are introducing pre-operative education classes to help reduce anxiety and educate patients about their surgery. But what other elements of the patient journey influence patient anxiety? In conversations with patients we have discovered that the wait for surgery after being admitted to hospital is one of the most anxious times. This is understandable, and so we surveyed over 100 patients who recently attended an orthopaedic patient information event and asked them how long they would like to wait between being admitted for surgery and the start of their operation. 88% said 4 hours or less, and 62% said 2 hours or less and comments included; “as quickly as possible”, “I would be very anxious – so as soon as possible”, and “within 5 minutes!”. 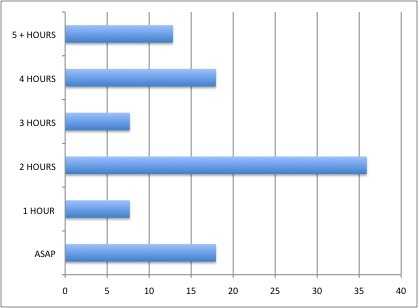 The graph below shows the percentage spread of how long patients want to wait. How long do your patients wait? How many wait more than 4 hours? Could you reduce this time? As always, we are interested to here your thoughts on this topic. Below are links to articles we have recently read on the subject that you may find interesting.